The Second Generation FlexyMike Single Ear – SE is an ultra-lightweight titanium alloy (about 5 g./0,2 oz.) ear hook microphone for professional speech recognition and other voice dependent applications. Manufactured in a unique 'clips on' style around a single ear for maximum working comfort. 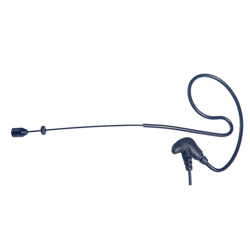 Flexible and easy to bend boom for consistent positioning of the microphone capsule enables precision positioning of the microphone for superior recognition accuracy with Dragon NaturallySpeaking. The FlexyMike Single Ear – SE has an omnidirectional polar pattern, which allows for a full 360° sound pickup, providing a natural blend of human voice in its ambient from. Its unique design effectively reduces background noise and popping sounds. The microphone capsule excels in delivering exceptional voice clarity with excellent background noise rejection, making it especially suitable for mobile users and notebooks or tablets, especially when used with the SpeechMatic USB MultiAdapter for maximum performance. Comments: Like all of our analog microphones, we recommend interfacing this with your PC or Mac with an external USB sound adapter. For a Mac this is a necessity. We recommend choosing either the Andrea Pure Audio (MA) adapter or the Speech USB MultiAdapter. Special Note: This microphone is designed for use on the left ear. The boom should not be bent in an attempt to mount it to the right ear. 11/29/2015 – Does this work with Microsoft word speech recognition for Windows 10? I'm a medical student and I'm looking for a mic that . . . Response From Speech Recognition Solutions: Yes, this works with Microsoft Word speech recognition for Windows 10.